Patio covers & enclosures allow homeowners to take existing decks, porches and other outdoor spaces and turn them into fantastic indoor & outdoor spaces! 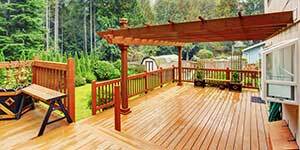 With the addition of patio covers and enclosures homeowners are able to enhance outdoor entertaining. Having a covered area will enable you to enjoy backyard parties and barbecues more often without the stress of weather and outdoor conditions. Patio covers and patio enclosures present a new area that functions as an additional room to protect your family and guests from elements out of your control. With a patio cover or enclosure you will have the opportunity to build that outdoor kitchen or bar you have always dreamed of! Custom patio covers seamlessly complement all styles of homes and can add beautiful architectural interest. Patio covers and enclosures also add an element of luxury to your outdoor space, maximizing comfort and providing protection from extreme heat and sun. The Butler Home Improvement design consultants will guide you through the planning process, and our professional installers will use high-quality materials to construct a patio cover or enclosure to provide many years of enjoyment for you and your family, offering you a functional, durable and beautifully crafted space that’s all your own. Patio Enclosures typically give you a room much like a three season sunroom. If pollen, wind or rain keep you from enjoying your outside covered patio or porch, this could be a great addition for you! The opportunity to take space that you don’t use very often and turn it into what may become the most popular room in the house. The best part of the room is, you may quite possibly use it year round. The Butler Home Improvement design consultants will help you transform your existing space and transform it into the room you’ve always wanted. Not to mention, a cost effective way to maximize your existing space and enjoy more time outdoors. Whether you want a patio cover or patio enclosure, Butler Home Improvement will offer our expertise and help you choose the solution that works best for your family. We stand by our commitment to provide the information you need to make an informed decision without ever making you feel uncomfortable or pressured. 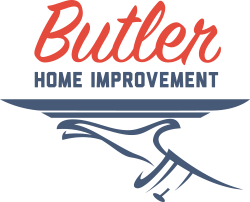 Butler Home Improvement serves St Louis, St Charles, O’Fallon, Collinsville, Edwardsville, Belleville, and the surrounding areas contact us today to get started! The patio covers constructed by Butler Home Improvement will perfectly fit your preferences and exceed your expectations. We take the headache and hassle off of your hands by comprehensively managing your project from start to finish. Have our design team help you make your selections. Make sure all permits are obtained by our planning team. Have our highly trained construction professionals make sure that every inch of your patio cover is built to code with strict adherence to manufacturer recommendations. Ensure your patio cover will have maximum structural integrity, also protecting any warrantees on the materials. Provide thorough Site Cleanup, making sure your home looks better than when we arrived.